TLDR: I don't like linoleic acid much. Tuberous Sclerosis (TS) is a genetic disease which affects mTOR signalling and predisposes to many problems, one of which is early onset kidney tumours. People with TS also have a tendency to suffer from intractable epilepsy so, almost by accident, a number of them have had their tumours closely monitored while eating a deeply ketogenic diet for the epilepsy. 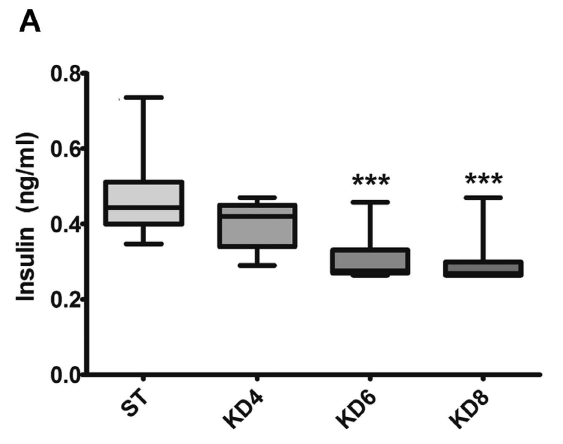 Does the KD help slow tumour growth? It is a very interesting paper. All rats were euthanased at 14 months of age, having spent differing periods of time eating a close derivative of the F3666 ketogenic diet. The longer the rats had spent on this diet, the more aggressive the renal tumour progression was found to be, especially in the rats which ate it for eight months (the longest duration). "Likewise, it has been shown that the growth hormone activates the MAPK pathway, thus its overproduction in the ketogenic groups may also boost ERK1/2 phosphorylation. We believe that HFKD induced the ERK1/2 activation results as a cumulative effect of the renal oleic acid accumulation and the systemic growth hormone overproduction". I'm not convinced by the oleic acid idea but no one would argue against identifying elevated growth hormone as a stimulant for tumour growth. Overall we have progressively falling levels of both glucose and insulin, with a progressively rising growth hormone concentration, over the eight months of a ketogenic diet. I asked myself if there might be an explanation for the nature of these reciprocal changes, before thinking about the tumour growth. Looking at the insulin-glucose levels we can say that insulin sensitivity increased with time on the ketogenic diet, using the surrogate HOMA score based on the product of insulin and glucose. That's despite a concurrent tripling of GH levels, which should induce insulin resistance. The obvious concept is that GH was being used to maintain normoglycaemia in a set of rats which were developing progressively increasing (pathological) insulin sensitivity and might, theoretically, have become hypoglycaemic on a very low carbohydrate, very low protein diet. That is, despite having been on a high fat diet, they failed to maintain adequate (ie physiological) insulin resistance to spare glucose for the brain. Does GH sound like a metabolic solution for the problem of pathologically increasing insulin sensitivity? Pathological insulin sensitivity: Is anyone thinking linoleic acid? Well, I am (now there's a surprise). The rats were raised on a standard chow of un-stated composition before switching to their KD. It seems a reasonable assumption that the chow was relatively low in fat. Exactly how much linoleic acid was supplied is unknown but other rodent chows I've seen described or analysed tend to provide about 2% of calories as linoleic acid. The F3666 derived diet looks, depending on the lard composition, to be in the region of 18% omega 6 PUFA. That's high (yes, another rodent study has shown that mice develop NASH on this diet, no surprise there). The rats were raised initially on a starch based diet so their juvenile adipose tissue would probably be composed of DNL derived saturated and monounsaturated fats, supplemented by a little PUFA from the diet. Transition to F3666, which provides approximately 18% of calories in the form of linoleic acid, generates a metabolism much more dependent on linoleic acid. The younger the rats were when they switched to F3666, the less "normal" adipose tissue they would have had available and the more rapidly they would end up with adipose tissue (and plasma) high in linoleic acid. 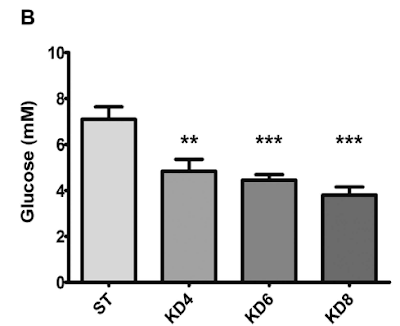 Rats on true ketogenic diets do not become obese, even on F3666. So we have slim, omega 6 fed rats. Small adipocytes, no excess FFA release, no insulin sensitivity differential between adipocytes and the rest of the body. 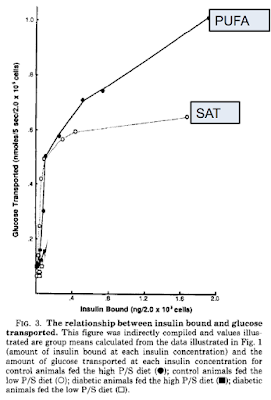 There is nothing to over-ride the insulin sensitising effect of linoleic acid. Both adipocytes and the rest of the body become progressively more insulin sensitive mediated through linoleic acid. They don't become obese because insulin stays so low due to the lack of carbohydrate and protein. The excess insulin sensitivity only kicks in gradually because their pre-stored, chow derived adipose tissue provides a supply of physiological FFAs which can act as a buffer to the sensitising effect of 18% linoleic acid for a while. Glucose falls progressively due to the development of progressively increasing pathological insulin sensitivity, linoleic acid induced. GH may well be a stress response to maintain normoglycaemia under these conditions. The GH may or may not be acting as a tumour promoter, but we cannot ignore the role of linoleic acid in its elevation. We all remember Sauer's rats with their xenografts which grew like wildfire as soon as he starved them? Yes. The tumours grew because they were exposed to linoleic acid released from their adipocytes under starvation. Linoleic acid is a precursor for 13-hydroxyoctadecadienoic acid, better known as 13-HODE. Sauer demonstrated that this was the problem very neatly, at the cost of extensive vivisection. I doubt anyone would be allowed to replicate his work today. At the end of the last post I mentioned that fact that any person who is currently obese through following conventional advice to replace healthy saturated fats with 13-HODE generating linoleic acid is probably carting around kilos of a tumour growth-promoting precursor. In Sauer's study all that was needed to release the linoleic acid was starvation. I would suggest that ketogenic eating might do the same, especially if it is based around saturophobic stupidity (think of kids in the USA with tuberous sclerosis on a "medical" ketogenic diet, or the rats in the above study). There is also anecdote on tinternet that patients of Dr Atkins did fine if they had CVD but those with cancer did badly. I find this plausible. They were obese because they were loaded with linoleic acid and they may well have followed an Atkins diet high in hearthealthypolyunsaturates. That's a good way to grow a cancer. Sauer found a solution in the form of fish oil to limit tumour growth in his rats, most especially EPA. The very long chain omega 3 PUFAs activate g-protein coupled receptors to reduce lipolysis from adipocytes and activate fatty acid oxidation from the diet. VLC omega-3 fatty acids do not promote excessive insulin sensitivity via the Protons based FADH2:NADH ratio concept because they are specifically oxidised in peroxisomes, not mitochonria. The peroxisomes shorten them to C8 length and then pass this to mitochondria as caprylic acid which has a "palmitate-like" FADH2:NADH ratio of 0.47 which is fine for maintaining physiological insulin resistance. You do have to wonder whether the benefits of fish/oil in a population loaded with linoleic acid might stem largely from this effect of limiting adipocyte release of that linoleic acid. An interesting idea. I still find it breathtaking how much the lipid hypothesis of heart disease might have done to injure individual people exposed to its recommendations. Which includes much of the world. This is a set of thoughts, jotted down without references, that have been of interest to me over the last six months while I have neglected poor old Hyperlipid. Linoleic acid produces excessive whole body insulin sensitivity. Adipocytes distend under this effect. Distended adipocytes release unregulated FFAs. FFAs cause insulin resistance which eventually overcomes the excess systemic insulin sensitivity. One of the core ideas which came out of the Protons thread was that palmitic acid is a generator of physiological insulin resistance. The complementary fatty acid is palmitoleate and this generates less insulin resistance for when insulin action is desirable. The function of physiological insulin resistance is to limit ingress of calories in to a cell when there is a surfeit of calories available. Or to limit the ingress of glucose when glucose is in short supply and it's best not to waste it on non-glucose dependent tissues. In to this well balanced system comes linoleic acid as a bulk nutrient. The oxidation of linoleic acid, by the Protons hypothesis, produces even less insulin resistance than palmitoleate and so undermines the ability of a given cell to refuse caloric ingress in excess of its needs. 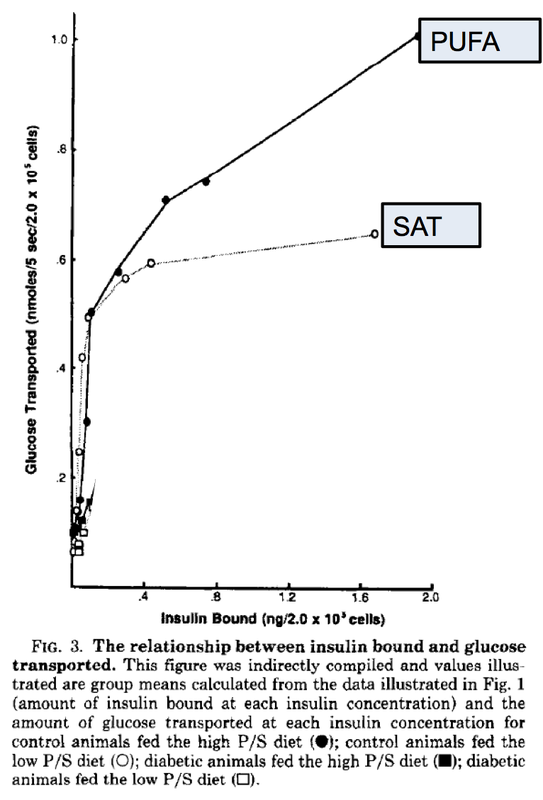 Failure to develop insulin resistance means that insulin continues to act. Continued action of insulin in a calorie replete cell results in diversion of excess calories to intracellular triglycerides (+/- glycogen). This is very reasonable in adipocytes, at the cost of obesity, but less acceptable in tissues such as muscle, liver and pancreas. The underlying pathology is continued inappropriate insulin sensitivity. But obesity is a condition more normally associated with insulin resistance. From the Protons point of view the question is: How can linoleic acid acid, which results in pathological insulin sensitivity whole body, eventually result in insulin resistance, also whole body? Insulin activates lipoprotein lipase and inhibits hormone sensitive lipase. Combined, these effects facilitate fat storage in adipocytes. But there is another lipase which controls both basal and stimulated lipolysis known as Adipocyte Triglyceride Lipase (ATGL). One, amongst the several, factors which control ATGL is perilipin A, a protein which surrounds the lipid droplet in adipocytes. It is probably an interaction between ATGL and perilipin A which determines the increase in basal lipolysis as adipocyte lipid droplet size increases. So there is a balance. Linoleic acid is allowing increased insulin action and so causing fat accumulation with a suppression of both FFA release and adipocyte lipid turnover. ATGL is looking to limit adipocyte distension by allowing lipolysis, so raising FFAs, outside of the control of insulin. But will only act on basal lipolysis in response to progressive lipid droplet expansion. For as long as the pathological sensitivity to insulin exceeds the FFA release driven by ATGL we can have worsening obesity but metabolic syndrome is delayed. Once the elevated glucose from insulin resistance kills off enough beta cells then insulin levels drop, glucose levels rise, HSL is disinhibited so FFAs rise. You might even get ketoacidosis. This is type 2 diabetes. ATGL might even take a break. The first approach to correcting it is carbohydrate restriction, so dropping hyperinsulinaemia and minimising the vicious cycle. Doing something about the kilos of linoleic acid stored in an obese person's adipocytes is an altogether longer term project. Can linoleic acid keep you slim? TLDR This is a weird study which might show the insulin sensitising effect of linoleic acid in obesity resistant rats. I deeply dislike this paper on so many levels. I'm not going to go through everything which is wrong with it, I'll just highlight a few aspects which strike me as interesting. The first (unexpected) finding is that none of the groups of rats on high fat diets were significantly heavier than the chow fed rats. 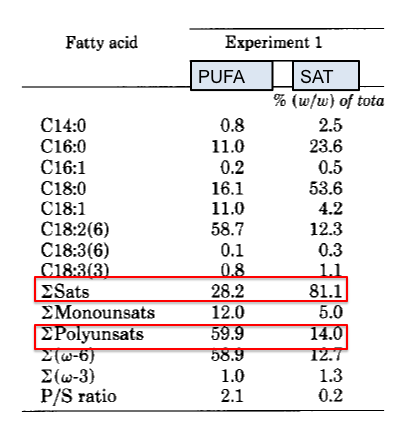 The PUFA fed rats were slightly lighter (you read that correctly) and the SAT fed rats were slightly heavier, but all ns at eight weeks of feeding. Who can buy rats which can eat coconut/lard and not gain weight? Korean rats? Korean lard? Who knows. But neither the safflower oil nor the lard fed rats become obese. I find this very, very odd in a set of "we bought them off the shelf" Wistar rats. But well, maybe. Just seems odd. Second point (expected) is that not only did the SAT fed rats develop insulin resistance, but the PUFA fed rats did not, in fact they showed enhanced insulin sensitivity when compared to either chow or SAT fed rats. This is compatible with the Protons view of PUFA oxidation in non-adipocyte distended rats. Third (expected) is that as insulin acted on muscles under PUFA those muscles developed the highest levels of stored triglycerides. This is exactly what you would expect, insulin diverts excess calories to be safely sequestered as triglycerides. The fourth point (very unexpected) is that while triglycerides were being happily sequestered in to muscle, they weren't being sequestered in to adipocytes. Adipocyte sequestration of triglycerides (obesity) happens routinely in a huge swathe of linoleic acid feeding trials in many different species. Sooo, can you extract anything from this mass of contradictions? 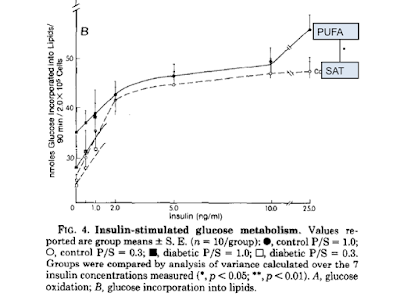 I'm just wondering whether if you happened upon a generally obesity resistant rat strain you might be left viewing the insulin sensitising effect of PUFA oxidation without the insulin resistance generating effect of adipocyte distension. Labels: Can linoleic acid keep you slim? TLDR: Growth hormone causes lipolysis, makes you slim, preserves muscle mass and makes you diabetic. Blocking the acute lipolysis of exogenous growth hormone exposure (acipimox again) stops the insulin resistance developing. The rest of the post is just me musing on clinical acromegaly, probably not interesting to most. 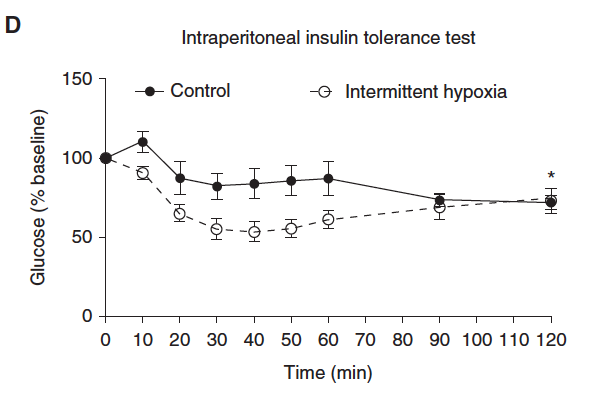 A follow-on to the paper using intermittent hypoxia to induce weight loss combined with glucose intolerance is to look at a similar effect from growth hormone. Growth hormone excess, amongst many actions, causes fat loss, muscle gain and diabetes. I'd picked that paper up while I'd been been reading about acipimox and then I'd heard a completely unrelated snippet of great interest about pancreatic amyloid in acromegalic cats. Ordinary (non acromegalic) diabetic cats frequently have amyloid accumulation within their islets. It's thought that amylin is co-secreted with insulin and forms precipitates of amyloid, if enough is co-secreted. Amyloid is also common in the pancreas of non diabetic elderly cats but this clearly begs the question of what you mean by "not diabetic". That's another line of thought for anyone who has read Kraft on diabetes in-situ. 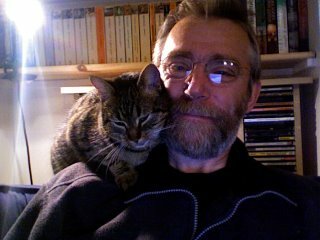 Anyway, the rumour I have heard is that acromegalic cats, diabetic or not, have no amyloid in/around their beta cells. Now, clinically, we don't measure growth hormone to diagnose acromegaly. We measure the ILGF-1 produced by the liver under the influence of GH. The question to me is: Does ILGF-1 act as an insulin mimetic under conditions of high GH? 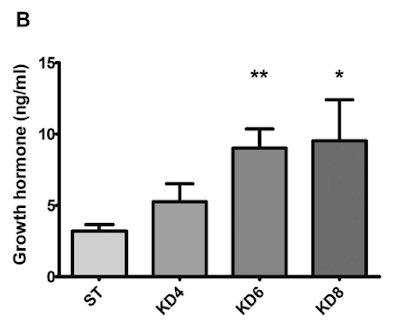 Are the islets of acromegalic cats free of amyloid because they are not needing to secrete so much insulin to develop those co-secreted amylin precipitates? Can ILGF-1 "side step" the insulin resistance caused by the elevated FFAs induced by GH excess? Or anything else? 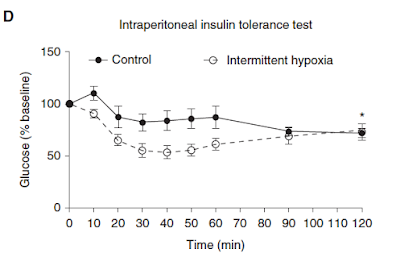 People with defective insulin receptors, insulin resistance A (the mild form) or Leprachaumism (the severe form) are diabetic and non-responsive to exogenous insulin. Genetically broken receptors don't work very well. 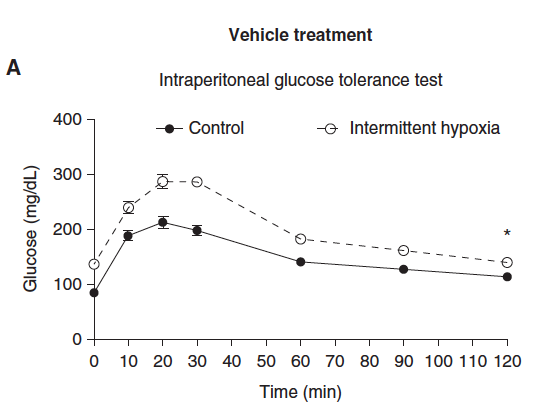 The same applies to people with Berardinelli–Seip syndrome but here the intense insulin resistance is caused by elevated free fatty acids and their intracellular derivatives following on from the lipodystrophy (this is much the same as the insulin resistance following weight gain from acipimox noted after exposure non-intermittent hypoxia plus acipimox in the last post, where exogenous insulin did nothing to blood glucose). Each of these severe insulin resistance syndromes respond to exogenous ILGF-1 with a sustained fall in blood glucose levels. TLDR: Linoleic acid makes your adipocytes insulin sensitive. As the adipocytes then distend under non-pathological levels of insulin they release FFAs which cause systemic insulin resistance, requiring excess insulin for normoglycaemia, so starting a vicious cycle. 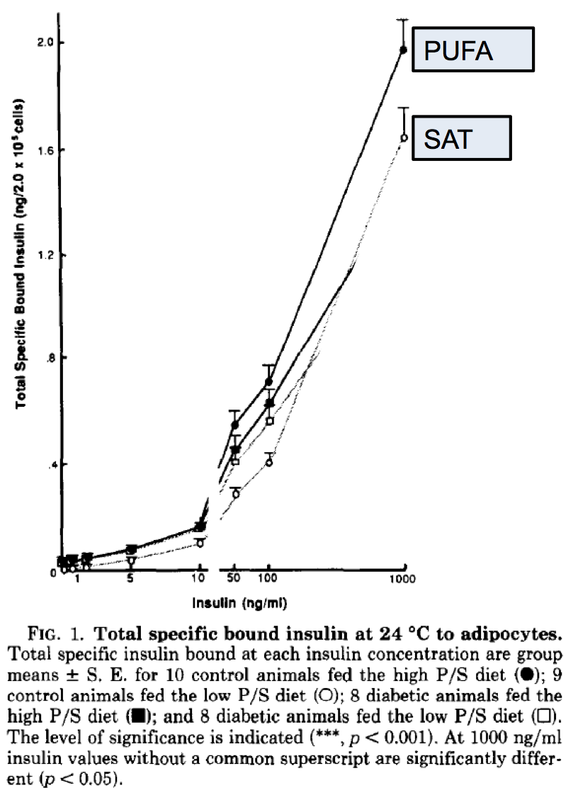 Measuring adipocyte response to insulin directly shows that they do not, under linoleic acid, become insulin resistant themselves. Diet fat composition alters membrane phospholipid composition, insulin binding, and glucose metabolism in adipocytes from control and diabetic animals. Obviously one is very high in polyunsaturates, the other in saturated fat. 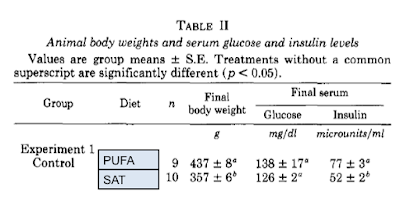 I've re-labeled the results from each diet with PUFA or SAT from here forwards because the P:S ratio labels they used aren't particularly clear and I've also crudely edited out most of the results for the streptozotocin (drug induced type 1) diabetic groups from tables and graphs because they're not related to what I want to say. 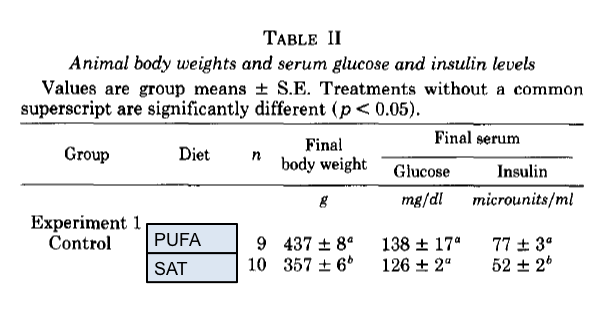 So if you compare feeding a PUFA diet vs a SAT diet, what happens to body weight after six weeks? Or you could, if you follow the Protons ideas, extract some adipocytes and look at their insulin sensitivity. Which is rather nice, if (as I do) you expect PUFA to allow too much glucose in to cells when insulin resistance is needed. 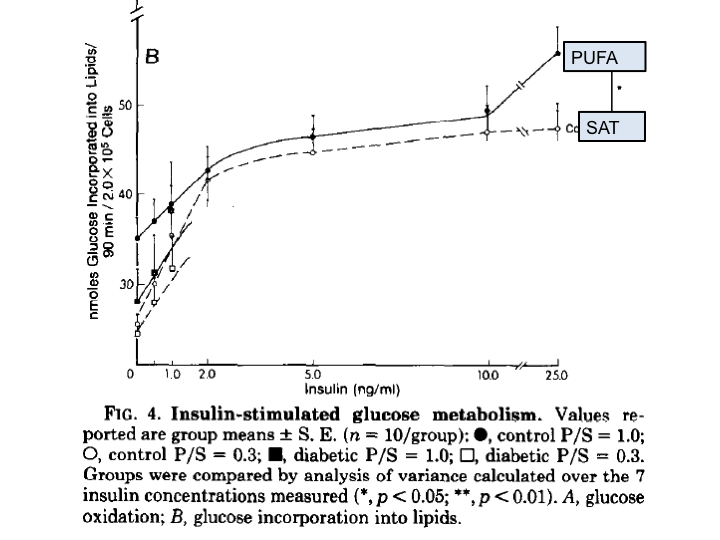 At the highest levels of insulin exposure more glucose is incorporated in to lipid under PUFA than under SAT and the trend is there at all levels. 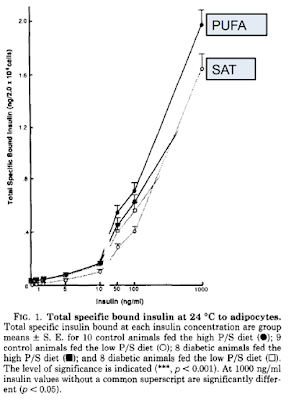 To me all of this suggests that adipocytes from PUFA fed rats are more sensitive to insulin than those from saturated fat fed rats. 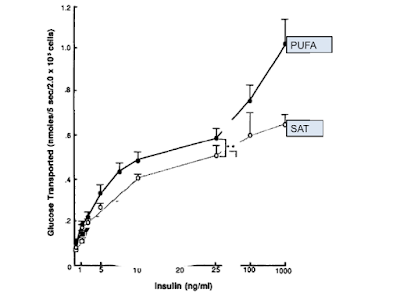 From the Protons point of view adipocytes (and all other cells) metabolising PUFA are unable to generate the superoxide needed to cease insulin signalling (too little FADH2 being delivered to ETFdh) when the caloric input to the cell is so high that glucose ingress should be limited. If this does not happen there are two consequences. One is that adipocytes distend with fat. Your cardiologist gave it to you. TLDR: Forced lipolysis gives weight loss and elevates FFAs which cause insulin resistance. Forced adipocyte distension causes obesity with secondary FFA release causing even worse insulin resistance. 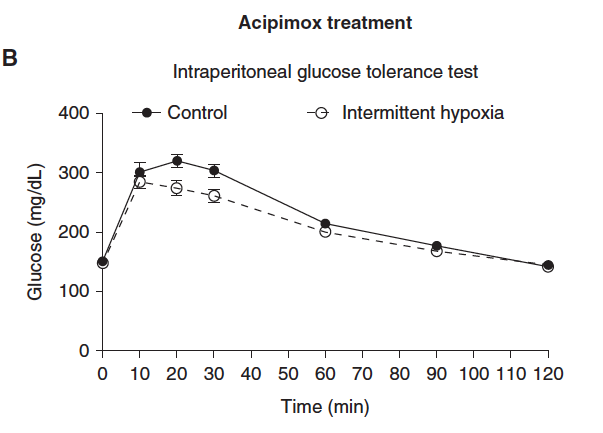 Well, I got a full text copy (thanks again to Mike Eades) of the acipimox in mice under intermittent hypoxia study. It's a very strange paper. But it has some aspects which I find interesting. They took groups of mice and kept them in a chamber for two weeks which either exposed them to severe intermittent hypoxia or no intermittent hypoxia. With or without acipimox. This is pretty simple and is exactly what you might expect. The AUC for the control group (black circles) is 18.2 mg/dl/120 min x 10^3. These mice (still black circles) lived in the same apparatus, were never exposed to IH but did drink acipimox for two weeks. These mice have become profoundly glucose intolerant, AUC is 26.9 mg/dl/120 min x 10^3. This is very glucose intolerant. Even the IH mice (open circles) only made an AUC of 24.2 mg/dl/120 min x 10^3. I have no idea what happened to their weight because the paper doesn't say. "Consequently, acipimox-treated mice presented with higher body weight and larger adipocyte size compared with vehicle-treated groups at the end of exposures. Because metabolic parameters in mice are strongly determined by body weight (22) and adipocyte size (23), anthropometric differences between acipimox- and vehicle-treated groups might explain higher spontaneous lipolytic rates and higher fasting glucose levels in acipimox-treated versus vehicle-treated control groups" [and extreme glucose intolerance]. My addendum. But you're not getting the weights. I am suspicious that the weight gains were such that stating them would have demanded a discussion of exactly why they occurred. 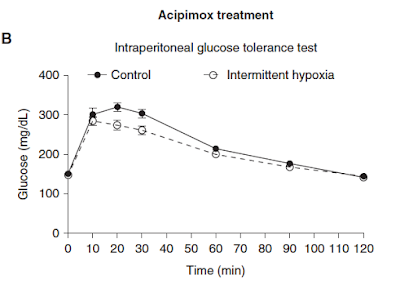 So a combination of being in the apparatus and drinking acipimox made the mice fat enough to mangle their glucose tolerance. The group also treated a set of mice with acipimox without putting them in the apparatus. Just left them in routine cages with or without acipimox. No problems with weight gain or glucose tolerance. So what can you take away from the paper? They have a quirky finding. A "That's odd" moment. A bit like Sauer finding that putting a rat in to starvation allows its xenografted cancer to grow like wildfire. But, unlike Sauer, they've just stepped round it and pretended it was unimportant. Their core finding, that inappropriately elevated free fatty acids (especially after acipimox) trigger glucose intolerance and insulin resistance, strikes me as very important. Lowering FFA with acipimox acutely (1-2 days) goes a long way to ameliorating metabolic syndrome (acutely), lots of studies on this. There is a significant role for FFAs in metabolic syndrome, largely related to adipocyte distention/dysfunction. It's not all of metabolic syndrome, but a big chunk. So from here I wandered around other triggers for elevated FFAs. Late additional thought: IH mice are thin and have elevated FFAs due to sympathetic nervous system activation. Their adipocytes are half empty, like a human on amphetamines or crystal meth. Given enough insulin there is room in the adipocytes to cram some more fat in, where it will stay until the next meth hit. So they can respond to a GTT. Acipimox treated mice have overstuffed adipocytes, that's why FFAs are elevated rather than due to stimulated lipolysis. Trying to cram more fat (with glucose for the glycerol) in to these adipocytes is almost impossible, a situation worse than that with those half empty adipocytes after IH or crystal meth exposure. Hello blog. Months of neglect means that I've just found "n" unread comments awaiting moderation. They are all so old that all I can do is apologise and tick the publish box, discarding the viagra spam on the way. Sorry for anyone who has tried to carry on a conversation via these comments! Life is a bit busy but thinking is still on-going so I'll put a few posts up over the next few days.